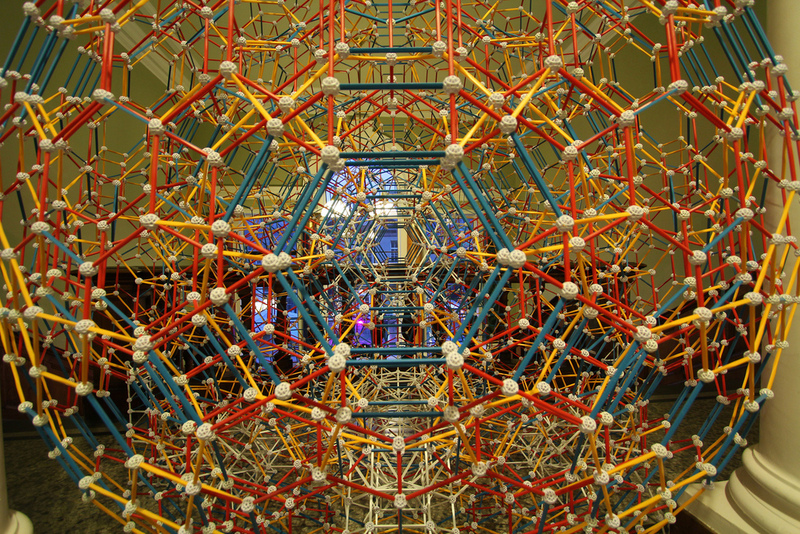 This is a model of a mathematical structure called a “Cantitruncated 600-cell”, colloquially known as a 4D buckyball. It took twenty people five hours to build and contains over 10,000 pieces of specialised plastic called Zometool. Such a model has never been seen in the UK before and I’m incredibly proud to have been able to organise its creation in Edinburgh last week. The sculpture perches at the top of the main staircase in Summerhall, a great arts venue which used to be the University of Edinburgh’s veterinary school. The hall in which we put together those pieces of plastic was no doubt designed for dissecting cows or lecturing students about the removal of dogs’ testicles. Instead, Monday’s event (held as part of the University’s Innovative Learning Week) led our students into looking at the anatomy of geometry and playing with very different sorts of balls. So what is a “Cantitruncated 600-cell”? The description on Wikipedia is less than enlightening. 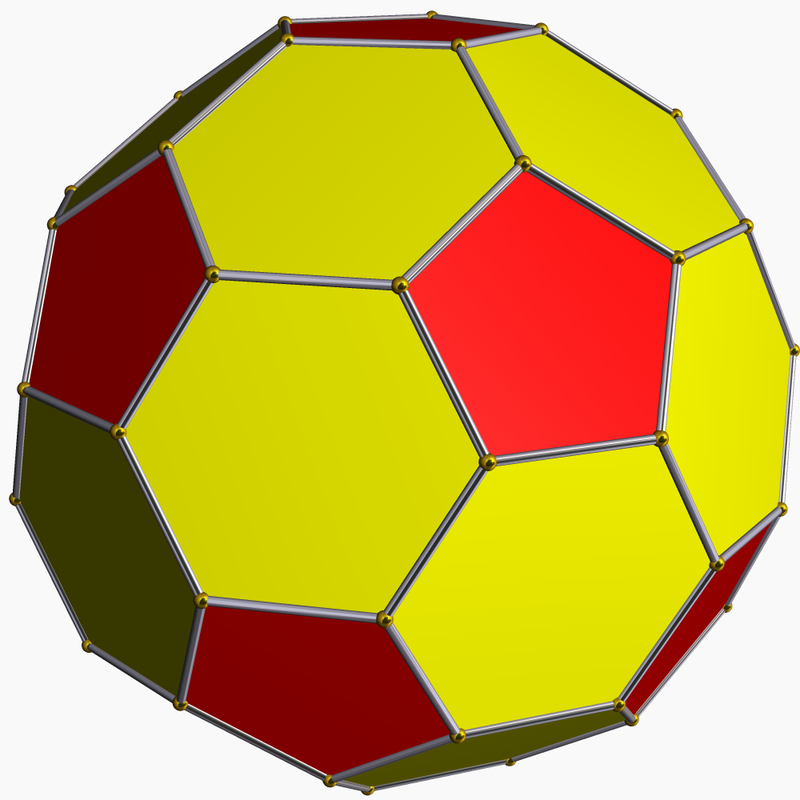 (It does, however, give some other cool names for this shape, including the “Cantitruncated polydodecahedron” and “Great rhombated hexacosichoron“.) Basically, the 600-cell is a shape made up of 600 tetrahedra (which in turn are 3D shapes made of 4 equilateral triangles) joined so that 20 of them meet at each corner. To ‘truncate’ means to ‘chop off the corners’. If we chop off a corner of the 600-cell, we see a shape which has 20 triangular sides – this is another regular 3D shape called an icosahedron. Chop corners off an icosahedron, and you get a football, or buckyball. ‘Cantitruncation’ means ‘truncate, then truncate again’. Truncating the icosahedron leaves us with a shape colloquially known as a buckyball, or football (see left). Putting these facts together, we see that our model is a 4D shape made of 600 tetrahedra, but where each corner has been chopped off and replaced by a buckyball. I have written a lengthier and much better explanation of this for the School of Mathematics website so recommend that you read that for more details! Otherwise just let your brain gently simmer in the crazy complexities of 4-dimensional geometry. Our 4D buckyball will stay in Summerhall until the end of the Edinburgh International Science Festival (20 April) and will (hopefully!) form part of the festival’s Art Trail. So go and see it while it’s there and tell me what you think of it! We are currently taking part in the Youth Philanthropy Initiative which allows us to make a case for a charity to receive £3000 funding. We were under the impression that you have been involved in the Maths Masterclasses over recent years, and we weren’t sure who to contact. We are looking to present the Edinburgh Maths Masterclasses to the YPI, as we have attended them and feel that they make a positive contribution to society. Would it be possible for an isolated donation to be made directly to the Edinburgh based masterclasses? Like your previous responder, apologies as I couldn’t find a private email for you to message you descretly. I came across your image of a buckyball and wanted to know if I could use the image in an article I’m writing that has some content about tensegrity. This is the best example I’ve seen that would give a ‘novice’ reader a visual concept of the way the human body is modelled on biotensegrity principles. I’d appreciate your help. Thanks. Since I wasn’t the photographer I will have to ask permission from them. I will try to get back to you soon.